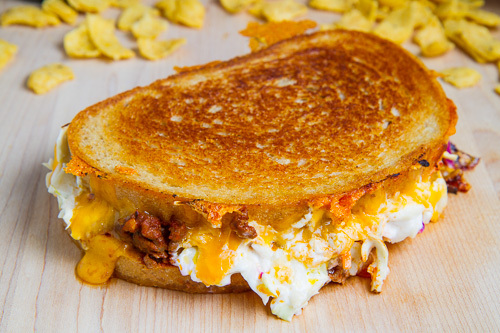 A grilled cheese sandwich with a sloppy joe filling; a truly sloppy gilled cheese sandwich! 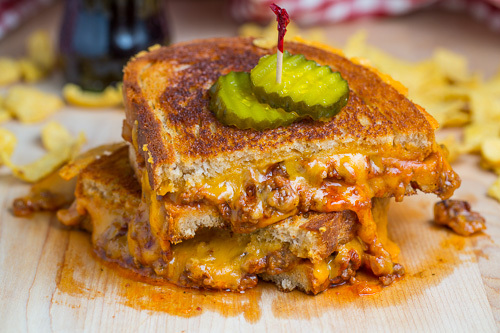 My next grilled cheese sandwich for National Grilled Cheese Month combines two childhood favourites, sloppy joes and grilled cheese, for one really sloppy sandwich that is kid approved! Sloppy Joes are a quick and easy meal consisting of a ground meat in a sauce that is served in a bun and as its name suggests it can be a little messy to eat. I figured that you really could not go wrong taking the filling of one already tasty sandwich and throwing it into a grilled cheese sandwich with plenty of ooey gooey melted cheese and golden brown, toasty and buttery bread! This is one of those cases where taking two things results in something that is greater than the sum of its part and this is one truly tasty grilled cheese sandwich! 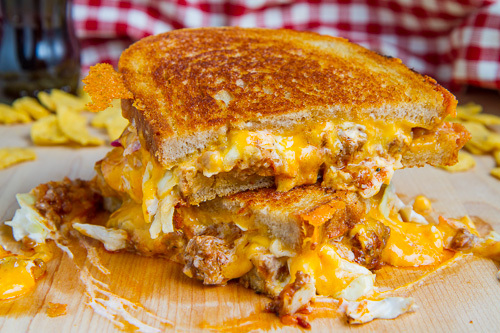 Like the sloppy joe, this grilled cheese can be a bit messy but it is definitely worth it! 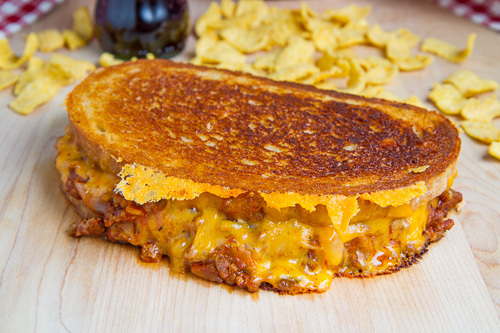 The next time you make sloppy joes, make extra for sloppy joe grilled cheese sandwiches for lunch the next day! 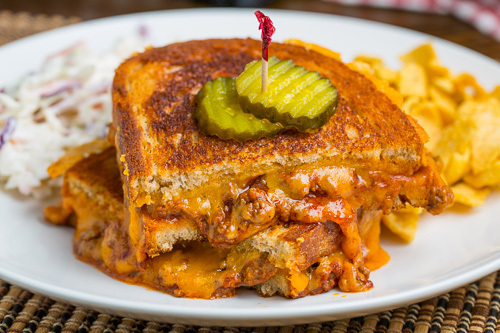 This sloppy joe grilled cheese goes well with coleslaw , corn chips and a pickle on the side. Of course you could always throw the coleslaw into the sandwich! Butter one side of each slice of bread, place one slice in the pan with buttered side down, top with half of the cheddar followed by the sloppy joes, the remaining cheddar and finally the other slice of bread with buttered side up. Seriously Kevin, you are the king of comfort food. Wish I were eating this right now! Kevin, your grilled cheese are amazing. Every one just looks so good!! Your Sloppy Joe Grilled Cheese Sandwich really got the best of both world…two of mt favorites as well. This is totally scrumptious and comfort food to me. You always make the most mouthwatering grilled cheese, this one looks awesome too! What kind of bread did you use it looks really good? curse you!! if I wasn't watching my calories I would be all over this Kevin, looks so good!!! !